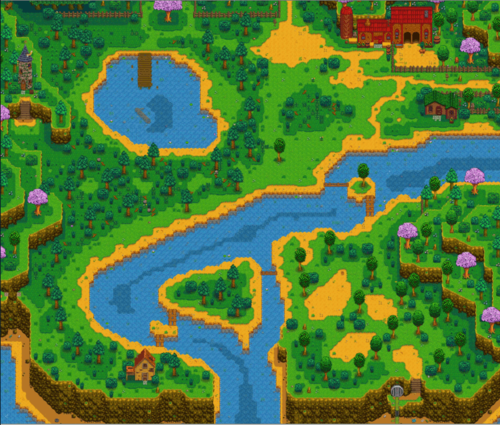 Cindersap Forest is the area located south of the Farm, and includes the Traveling Cart, the Wizard's Tower, the Abandoned House, Leah's Cottage, and Marnie's Ranch. It has exits to the north into the farm, the east into Pelican Town, to the south into The Sewers, and to the northwest into the Secret Woods. As expected, Cindersap Forest contains a large variety of Trees. These trees behave normally, yet do not need to be re-planted once they have been chopped down: a new Tree will reappear in its place within the average time it takes a Tree to grow. During the start of Spring (around day 1-14) you can find Spring Onion on the dirt spots of the southeast of the map, near the sewers. Those are a really useful energy source when the player is starting a new game. 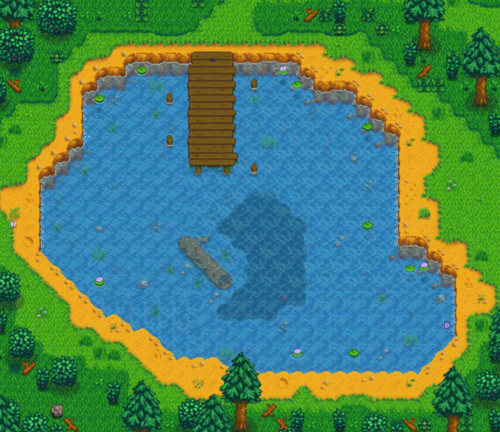 Located in the northeast corner of the map, this is where you can purchase animals and animal related goods. Marnie lives here with her niece and nephew, Jas and Shane. 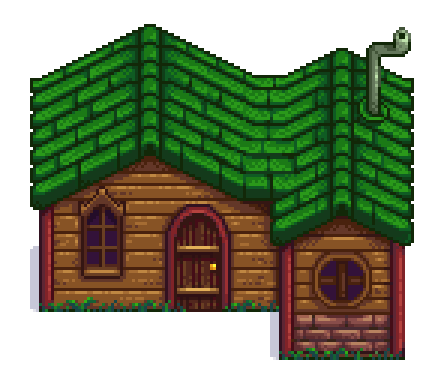 Located just south of the path to Pelican Town, this is where Leah lives. A large body of water in the center of the map. A small pier juts out into it for fishing. River Fish can be caught here. An extension of the southern river with several islands. River Fish can be caught here, and its deeper waters are home to the Glacierfish in the Winter. 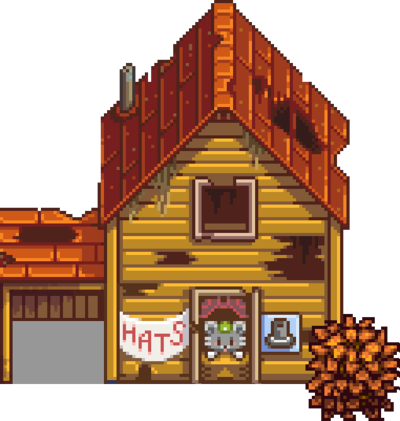 Located to the southwest of the pond, this run down building will open up shop when you start earning Achievements. Once open for business, a mouse will sell you hats based on the achievements you've unlocked. Located on the western side of the map, the Wizard lives here. 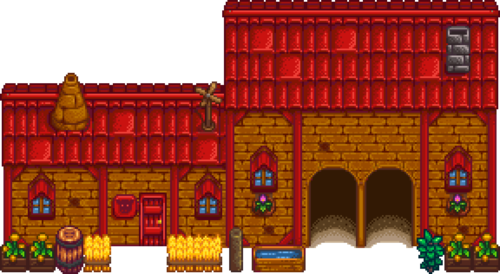 You can enter the tower once you have been in the Community Center for the first time, examined the letter in the Crafts Room, and received a letter from the Wizard. An area in the northwest corner of the map that you can open up once you have a Steel Axe. 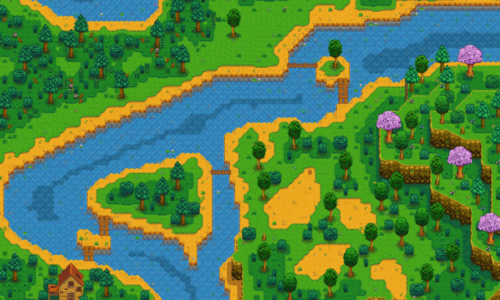 It is a natural habitat for a variety of Slimes and a good source of Hardwood. 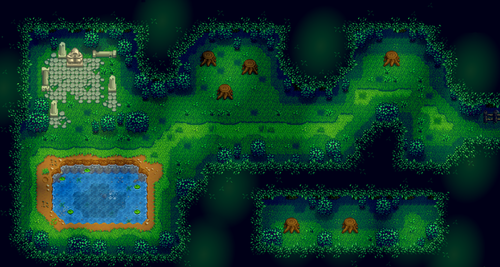 Note that there is a hidden section accessible by walking down through the trees, which contains more stumps, slimes and potential foraging spots. Everyday, all Hardwood stumps re-spawn. 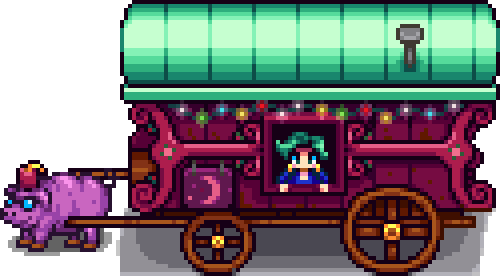 Giving a Sweet Gem Berry to Old Master Cannoli, you will receive a Stardrop. Works only one time. Appears every Friday and Sunday along the northern edge of the map and sells a wide selection of random goods. This page was last modified on 15 November 2018, at 16:21.